« The Boards: Defender is Alive! 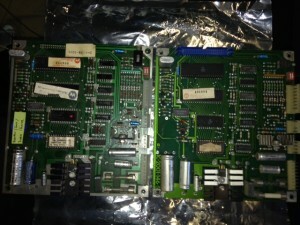 Interestingly the sound boards for the Williams machines of this era, are basically stand-alone mini-computers that are just triggered with which sound to play, by the main CPU board. Think of it kind of like a door-bell, where you can press different buttons to get different sounds as you go down the street. So I was researching the best way to test the boards (I have no sound at the moment) and there is this amazing video of some nerdy guy who used to repair arcade machines in the arcades in the 1980’s, who used to take home all the sound boards from dead arcade machines (Williams’ Defender in the case) and turn them into door-bells himself. So you can basically actually build a totally separate test circuit (power and speaker) for the Williams Sound Boards, and test them individually without needing the rest of the system connected. You’ll need the board reference PDF showing which version of the board you have and the correct Sound ROM installed and in case you wonder where you are going to get -12V for your test rig from, the Williams Guru, Dave Langley, says you can just use the standard -5V you get from your switching power supply to do this instead and it will work fine. Print article This entry was posted by Judder on November 19, 2013 at 3:30 pm, and is filed under The Boards, Williams Defender restoration. Follow any responses to this post through RSS 2.0. You can skip to the end and leave a response. Pinging is currently not allowed. The PIA (Peripheral Interface Adapter) chip, according to the Williams Pinball experts, has the ability to quite often malfunction. Interesting note: In fact the same PIA chip is used for ALL of the external boards that interface with the CPU board. So if any of these are showing problems, they can be interchanged and replaced. my defender sound effects no longer work I get speaker noise when I adj the volume controller and many recommend the 6821 pia be replaced so I replaced with new and now I get beeping noises when the appropriate sound effect should be played do I need to program the replacement or is it just a drop in. Q: No sound. Speaker “pop” at switch on is present. A: Faulty 6808 @ IC9 on sound board. Replacing the IC fixed the problem. A: All data pins on 6808 were floating. 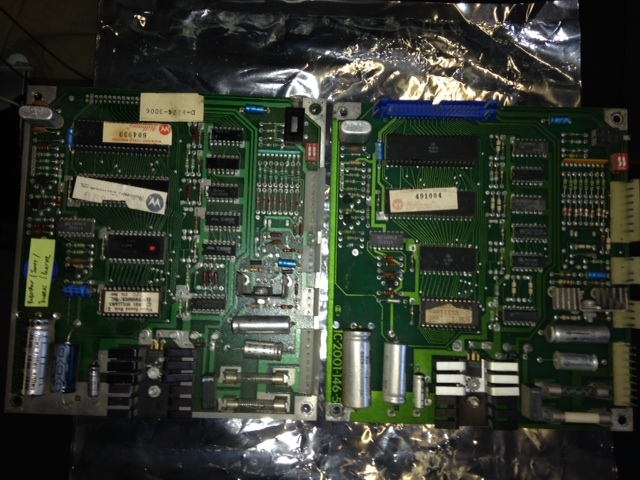 Problem traced back to a faulty 6810 @ IC11 on sound board. Replacing the IC fixed the problem. 1) On start I sometimes will get or not get the 2 start sounds. 2) Game loads and appears to function correctly. 3) Pushing the test switch on the sound board, I get a looping sounds (appears normal?). 4) on test switch on coin door, run sound test, no sound. 5) on game play, no sound. Here is what I have completed to help resolve the issue. Still no progress. I am leaning towards the issue being on the ROM board (IC)?